If hay fever has affected your enjoyment of our recent heatwave, you’re not alone. Hay fever affects around one in five of us and you can develop it at any age. 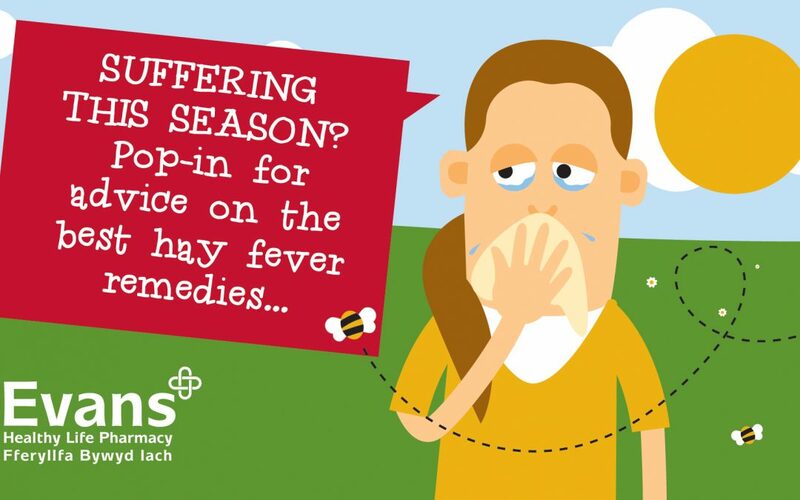 Most of us living in Wales would say it’s one of the most beautiful places to enjoy summer, but it’s also one of the worst places if you suffer from hay fever – especially if you’re sensitive to grass pollen. Before you make plans to up sticks and move, we have some tips to help you manage your hay fever symptoms, so you can make the most of the hay this summer. Why do we get hay fever? Couldn’t it just be a cold? It’s possible, but a cold will typically last just 1-2 weeks. If your symptoms persist for weeks or months, it’s more likely to be hay fever. What can I do to get rid of hay fever? You can’t cure yourself of hay fever, but there are some easy, practical ways you can minimise yours or your family’s symptoms so you can enjoy summer. Keep your windows and doors shut as much as you can to stop pollen getting into the house. You could also invest in an air purifier with HEPA filter to trap any pollen that gets in. Vacuum and damp-dust your home regularly to prevent pollen spores circulating. If you can use a vacuum cleaner with a HEPA filter so much the better. If you’re really suffering, showing and washing your hair when you come inside will also help remove offending allergens. This goes for pets too – they can carry a lot of pollen on their fur. Cutting grass or walking on it too much – a great excuse for someone else to get the lawnmower out! Alcohol – this contains histamine which can trigger an allergy response. Its dehydrating effects can also make your symptoms worse. Pop in and have a chat to your local Evans’ team. We can give you advice on over the counter treatments like eye drops and nasal sprays, as well as antihistamine tablets to help you prevent and manage your symptoms. Antihistamine tablets which can stop the release of the chemicals we mentioned above – there are lots of options, including Loratadine and Piriton. Corticosteroid nasal sprays like Beconase and Flixonase which can treat symptoms within a couple of weeks and stop your nose becoming inflamed or blocked – they’re also a great preventative treatment. Eye drops such as Opticrom which can be especially helpful for treating the itchiness and inflammation caused by grass pollen. It can take a few days of regular use before you see the real benefit from these remedies, and as with any medication, they will work best when you follow your pharmacist’s instructions. To have a chat about any of the tips or remedies above, please get in touch with your local Evans Pharmacy or pop in-store and see us. We’re here to help you enjoy a happy, healthy summer.